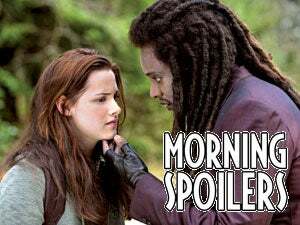 The Monday morning spoiler-backing begins with new pics of Don Cheadle in Iron Man 2 and Amanda Seyfried in Jennifer's Body. Plus the inside scoop on Caprica, Pandorum, New Moon, V, Fringe, Flashforward, Warehouse 13, Eureka, True Blood and Eastwick. His name is Manh. He's an agriculture specialist and he's been awake for a while. The storyline is two crew members wake up and don't know where they are at. Or what their mission is. I've been awake and I know what's going on and I've been surviving on this ship. Over time he's battle-hardened. He knows what to do. More details from the set. Hollywood.com watched the filming of a scene where Volturi leader Aro taunts Edward from the other side of a wall. Aro says it's a delightful surprise that Bella's still alive, and says it makes him hungry. He asks Edward how he can stand being so close to Bella's yummy blood, and Edward says it's not without its difficulties. Responds Aro, "So now you know everything. Fascinating. I'd love to see if you are an exception to my gift as well. Would you do me the honor?" Then he stares at Bella, and nothing happens. "Interesting. I see nothing. I wonder if — Let's see if she's immune to all of us, shall we, Jane?" Cut to Dakota Fanning, who smirks, since she has the power to inflict pain.